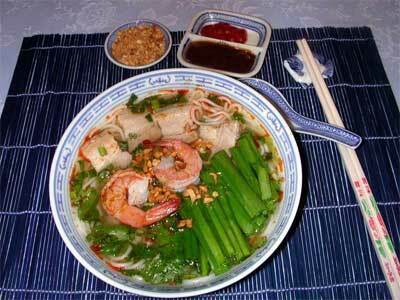 “Bun goi da” is a special noodle soup which is one of the most appreciated by visitors to Soc Trang Province. The strange dish is originated in My Xuyen Town, Soc Trang Province. Leaving the city of Soc Trang some 5 km to My Xuyen Town, you can see a board "bun goi da" suspended before the small stall. While waiting for the dilicious dish moved out, you can view the cool green trees, smelling the fragrance of delicious dishes. The best “bun goi da” is served at a small and shady stall in a quiet street at old Bai Xau, a site which used to be buoyant port serving the 6 Southern provinces. The shop-owner Trinh Thi Nu, is a retired school teacher in Can Tho City. 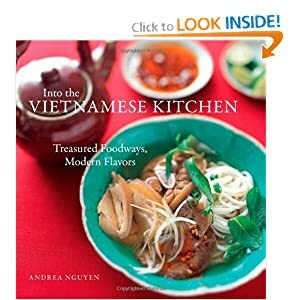 She takes a very good care to ensure the best quality of the dish which requires a number of ingredients including rice noodles, pork, prawns, soybean paste, sliced red chilli and some herbs. Having put these things into a decoratively presented bowl, a flavoured hot broth, the most important thing to decide the taste of the dish, is added to the mixture. “Bun goi da” is even more appealing with some fresh vegetables. It has been one of the favourite dishes for both locals and visitors in Soc Trang Province. Each bowl is a mere 12,000 to 15,000 VND. For many years, “bun goi da” have made the journey to Ninh Kieu District, Can Tho City, help to improve people’s living standard. Moreover, “bun goi da” is also served in Hoang Cung Restaurant of Saigon - Can Tho Hotel. Although the price is 20,000 to 25,000 VND for a bowl of “bun goi da”, the luxurious seat will help you delight in watching the street and the bowl of “bun goi da” is much more delicious. Not only the favourite for many visitors, “bun goi da” is one of traditional dishes in Soc Trang Province. Once enjoying and you can feel the typical fragrance of the dish.